Call us 24/7 for all of your computer problems. We are at your service, we can come to your home or office. This saves you time and money. We provide pickup and drop-off service, at no additional cost! Our IT experts simplify the geek language, so you know the service you received. If your computers speed is equivalent to the dial- up days, we can speed up your computer to modern times. We set up your computer network so your computers can share files. Want to keep an eye on your property when you’re on vacation, we provide security camera installation. We can backup your precious photos, music, personal information, and business records to an external device and to the Internet. Computers make our life easier so when they break down its very devastating. 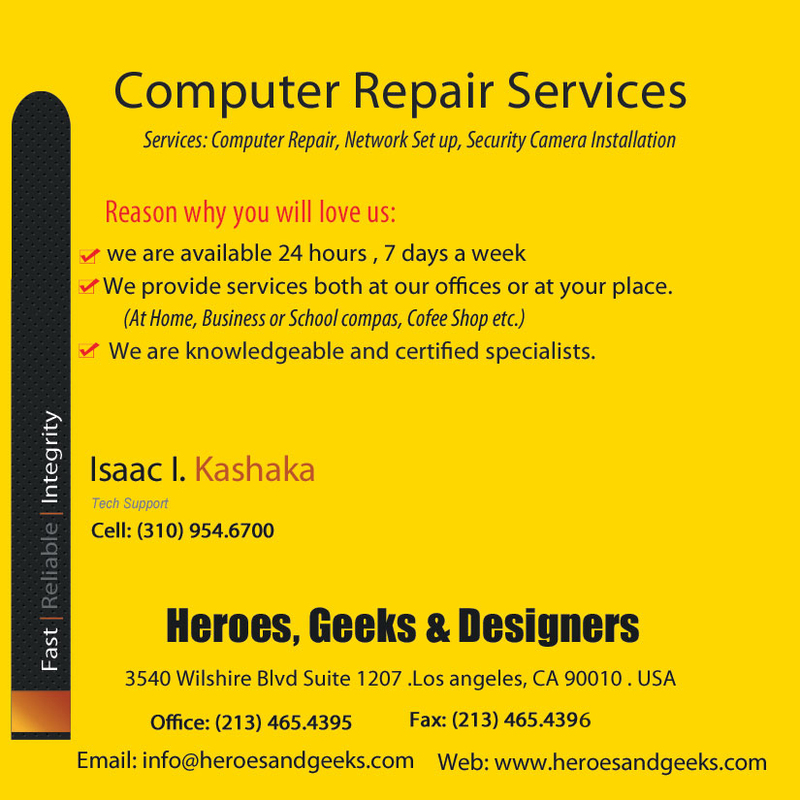 That’s why Heroes and Geeks computer repair services in Los Angeles provides convenient service to make the situation more bearable. When your computer breaks down you want it to be repaired as fast as possible and at a reasonable price, Heroes and Geeks understands that and delivers. Next time you have a computer problem and want a convenient and easy repair that’s also considerate to your wallet, consider hiring Heroes and Geeks. We understands people’s needs. We tailor our services to the individual unique situation, we don’t treat our customers like a number.